How did the novel—once a fairly messy, undefined, and somewhat disreputable genre—become the dominant form of modern literature? How might we think about the genre’s history from its earliest forms to the present day? In what ways did the development of certain novelistic conventions (familiar plot structures, techniques of narration and characterization, ways of organizing time and space, etc.) overlap with the social transformations that shaped the long modern era? What is the novel’s relationship to everyday life and to the institutions that structure so much of modern social experience, from schools to prisons, from the family to the state, from museums to imperial bureaucracy, and from factories to publishing houses? In what ways did the novel become an institution itself? We will consider these and other questions as we read British and Anglophone fiction from the eighteenth through the twentieth century and beyond. 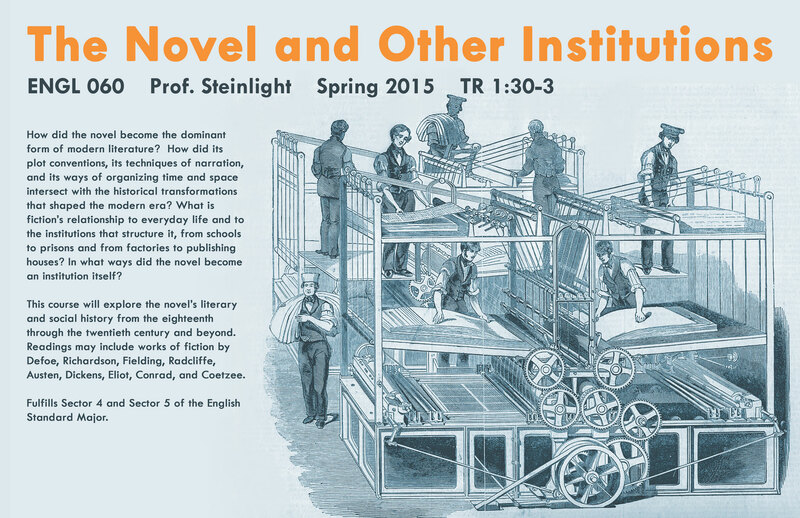 Readings may include novels by Defoe, Richardson, Fielding, Austen, Dickens, Eliot, Conrad, and Coetzee. Requirements will include two short essays, a longer final paper, and active participation.